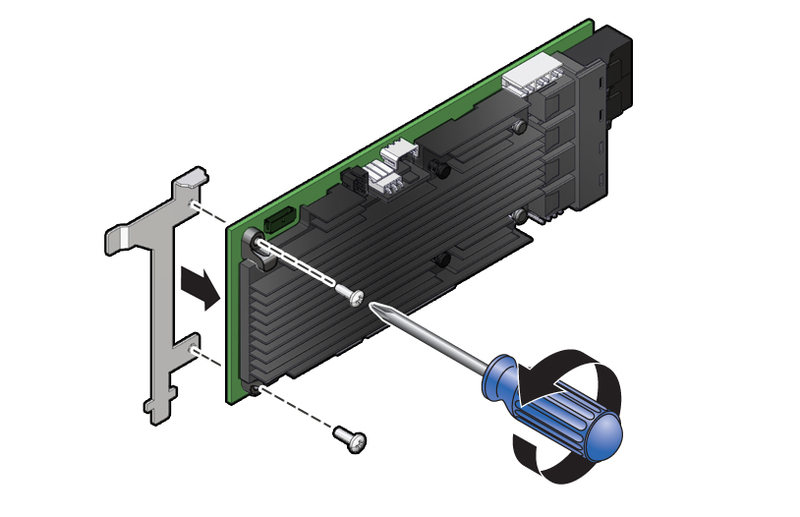 Remove the PCIe riser from slots 3 and 4. 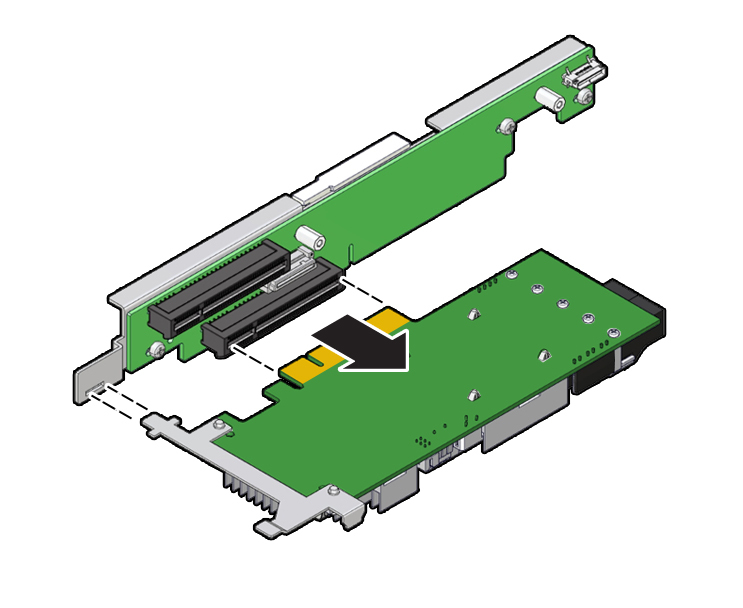 Remove the internal host bus adapter card from the riser. Hold the riser in one hand and use your other hand to carefully remove the card from slot 4 of the riser. Disconnect the SAS cables and the super capacitor cable from the internal HBA card and place the card on an antistatic mat. If you are replacing the internal HBA card, use a No. 2 Philips screwdriver to remove the special fitted bracket from the HBA card. You will need to install the special fitted bracket on the replacement HBA card. Set aside the bracket and screws until you are ready to install the replacement HBA card. Lift the super capacitor up to release the reclosable fasteners that secure it to the server's chassis [1, 2]. Note - If you are removing and replacing only the internal HBA card, you do not need to remove the HBA super capacitor. You can disconnect the HBA super capacitor cable from the internal HBA card and then remove the internal HBA card from the system. Note - (Optional) Disconnect the data cable from the disk backplane to allow easy access to the super capacitor. Disconnect the super capacitor cable from the super capacitor and place the super capacitor on an antistatic mat . 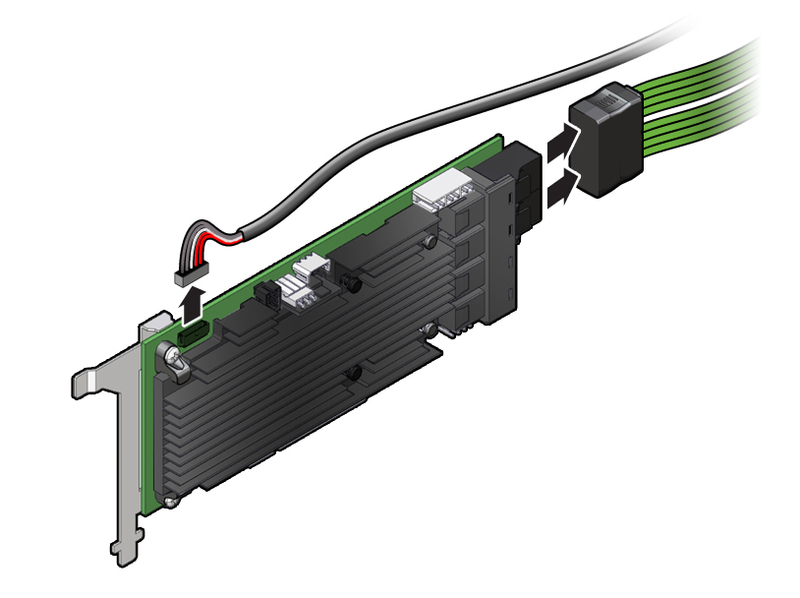 Carefully remove the SAS cables and super capacitor cable from the server by lifting them from the left-side cable trough. See Remove the Internal HBA Cables.